She was going to be Batman’s wife, and now she’s living in an abandoned storage facility in Villa Hermosa, California, second-guessing her decision as she spends her time gambling and lying awake in a half-empty bed. The new Catwoman ongoing series by writer/artist Joëlle Jones and colorist Laura Allred reveals a more vulnerable, lovesick side of the leather-clad thief, but Selina gets a distraction from her heartbreak thanks to a gang of copycats who have stolen her look to commit crimes. Jones gives Selina a new home, supporting cast, and nemesis, but even though this is a chance to start over, Selina is still tethered to the mistakes of her past. 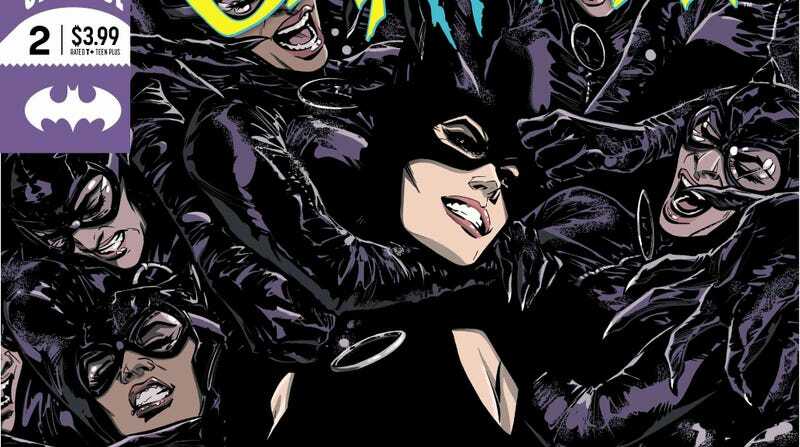 This exclusive preview of this week’s Catwoman #2 has Selina facing off against the opponents who have raided her wardrobe, putting a spotlight on Jones and Allred’s action storytelling skills. Catwoman has a new costume to set her apart from the other fighters, and Jones’ redesign falls somewhere between Michelle Pfeiffer’s look in Batman Returns and the Darwyn Cooke design that redefined Catwoman for the new millennium, leaning into the kink factor of the character without oversexualizing her. Gone are the goggles to give more focus to Selina’s piercing green eyes, which makes the character more soulful when she’s in costume. Jones and Allred did exceptional work together on Dark Horse Comics’ Lady Killer series, and Allred’s flat rendering and bold palette keep the focus on Jones’ rich inks while adding intensity to the artwork. When Selina makes her first move, Allred colors the background of the panel with the same green as her eyes, asserting through color that Selina is in the position of power in this situation. The final panel of that second page is a drop dead gorgeous image that frames Catwoman between her two whips, revealing how the exposed armpits and wrists introduce new blocks of color to her previously all-black ensemble. Jones pays tribute to Cooke’s look by drawing it about 50 times in this issue, but she’s also giving Selina something new to indicate how her character has changed over the years.